The CW's further exploration of genre programming continues to give the channel more and more of a presence at Comic Con and this year will be no different. In fact, a good portion of their Fall 2013 line-up will be featured in panels at SDCC. Following word that Warner Bros. TV will be bringing Supernatural, Arrow, Nikita, The Vampire Diaries and new series The 100, The Tomorrow People and The Originals for either Preview Night screenings or panels, comes word that CBS Studios has two more CW shows - Beauty and the Beast and midseason sci-fi drama Star Crossed - lined up to be featured in panels at the convention. For CBS, the upcoming new series Intelligence and their currently airing summer series Under the Dome will also be featured in panels. Josh Holloway, Aimee Teegarden, Kristin Kreuk, Dean Norris, Mike Vogel and Rachelle Lefevre are among the names listed in the panel information below for CBS studios' Intelligence, Star-Crossed, Beauty and the Beast and Under the Dome. Brian K. Vaughan will also be there for Under the Dome, which should please fans of the series as much as it does fans of his comic book writing. Meanwhile, CW fans may already be excited for Beauty and the Beast, which is headed into its second season, they may be curious about another modern-day take on a classic story - the sci-fi Romeo and Juliet mash-up that is Star-Crossed, which stars Teegarden as a teen who develops a relationship with one of the alien teens now attending her high school. The details for the panels were announced on the studio's tumblr today and you can read them below, plus we've added the trailers for the three new series. Josh Holloway (Lost) makes his highly anticipated return to television in the new CBS series INTELLIGENCE, with co-stars Meghan Ory (Once Upon a Time) and Marg Helgenberger (CSI: CRIME SCENE INVESTIGATION). Be the first to see the world premiere of the first episode, followed by a panel discussion with series stars and executive producers Michael Seitzman (North Country), René Echevarria (Terra Nova, Star Trek: Deep Space Nine) and Tripp Vinson. The panel discussion will be moderated by Debra Birnbaum, President and Editor in Chief, TV Guide Magazine. Holloway, Ory and Helgenberger will participate in an exclusive autograph signing following the panel at the CBS Interactive Booth at 11:15 AM-12:00 PM on the convention floor. It’s a war of the worlds when an epic “Romeo and Juliet” romance ignites between a human girl and an alien boy, as he and others of his kind (Atrians), are integrated into a suburban high school after being banished for ten years. As this romance causes a violent encounter between their two families, can this couple’s love – and peace between the species – survive? Join Matt Lanter (90210, Star Wars: The Clone Wars), Aimee Teegarden (Friday Night Lights), Grey Damon (Secret Circle, Nine Lives of Chloe King) along with executive producers Adele Lim (One Tree Hill), Meredith Averill (THE GOOD WIFE), Josh Appelbaum and Andre Nemec (Mission Impossible, Alias), and Scott Rosenberg (Gone In 60 Seconds, Con Air) for a first-look at a futuristic story of forbidden love,STAR-CROSSED, from The CW network. The panel discussion will be moderated by TVLine’s Meg Masters. For the latest updates on STAR-CROSSED, go to www.facebook.com/cwstarcrossed and follow @CWStarCrossed and stars and producer @Aimeeteegarden, @DamonGrey, @MattLanter and @mereschmere on Twitter. Paging all Beasties! Kristin Kreuk (Smallville) and Jay Ryan (Terra Nova) along with executive producers Jennifer Levin (Without a Trace) andSherri Cooper (Brothers and Sisters) invite all #Beasties to join them for an exclusive discussion of what is ahead for #VinCat and the sophomore season of the breakout fan-favorite series from The CW network. The cast and producers have a special surprise for fans at the panel which will be moderated by Jenna Busch from Fanhattan.com. 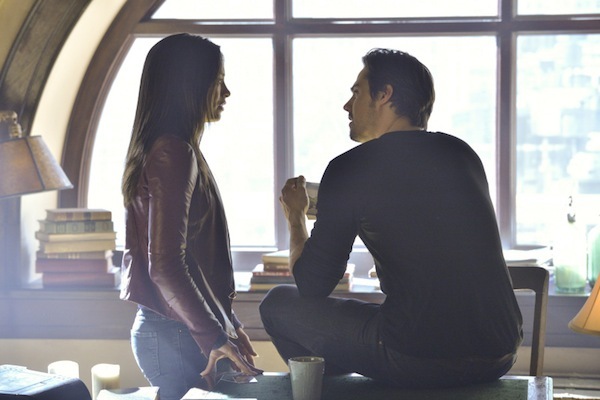 For the latest updates on BEAUTY AND THE BEAST, go towww.facebook.com/BeautyandtheBeast, http://batbnation.tumblr.com, and follow @CWbatb and stars and producers @JayRyan, @MsKristinKreuk, @NinaLisandrello, @AustinBasis, @Sendhil_Rama, @BATBWriters, @sherricooper22 and @jenniferlevin22 on Twitter. The dome has descended upon Chester’s Mill and there is no way in or no way out! Get a sneak peek of what’s in store for the town and its residents as they become sealed off from the rest of the world in this summer’s critically acclaimed series based on the bestselling book by Stephen King, from Amblin Television. Stars Dean Norris (Breaking Bad), Mike Vogel (Bates Motel) and Rachelle Lefevre (Twilight) will be joined by executive producers Brian K. Vaughan (Lost) and Neal Baer (Law & Order: SVU). Norris, Vogel and Lefevre will participate in an exclusive autograph signing following the panel at the CBS Interactive Booth at 3:30 PM – 4:15 PM on the convention floor. For the latest updates on UNDER THE DOME, go to www.facebook.com/UnderTheDomeCBS, http://underthedomeoncbs.tumblr.com, and follow @UnderTheDomeCBS and stars and producers @DeanJNorris, @RachelleLefevre, @nataliemartinez, @RealBritt_Rob, @colinfordactor, @1NicholasStrong, @jojopurdy, @mackenzielintz, @NealBaer and @AishaHinds on Twitter. Keep up to date with our Comic Con coverage here!